Spite Houses? Living without Regrets and Playing Virtual Reality in Toronto - Happy Thanksgiving! It’s Turkey time here in the USA, and we’ve got a lot of crazy news out there. Let’s put down the news feed, and instead feast on some Happy Wisdom for a Happy Thanksgiving! Under the category of WIERD, we find the most unusual form of bad behavior – Spite houses. This is what it sounds like: someone builds a house out of spite for whatever reason. You’re going to BUILD A HOUSE to get back at someone? That’s amazing. This affects the Seattle area in an interesting way – we have an unbelievable real estate boom here, top in the country. There is legislation being proposed to allow people to build Mother-in-law houses on their lots. Before I saw this post from URBO I thought it a good idea, but now, not so much. Speaking of the Seattle area, check out this little fellow, called the Montlake Pie House house since it’s about the size of a slice of pie and is shaped like one too. 400k? Keep going…$500,000! I guess location really is everything! Inc. Magazine often has some great items on it. It’s tempting to feel a little life-tip fatigue, but I see it as a way to get reminded in clever ways to do good things for yourself and others. The title of this one, 7 Rules to Follow If You Want to Live a Life Without Regrets, is quite grand. It’s a good list though- I’m particularly fond of the 4th one, especially around Thanksgiving time, when things can get hectic. A well-lived life doesn’t mean a life jam-packed with adventures and achievements. It means a life in which you take the time to appreciate what you have. “It’s in the quiet, still moments that we feel what matters in life. Standing on the shore of a lake. Looking out over a canyon. Resting your head on someone else’s. It’s a shortage of these moments that give rise to the feeling that we haven’t lived enough, that we have to keep going. Seeking them out, encouraging them is what makes you feel like you’ve done plenty,” insists Holiday. 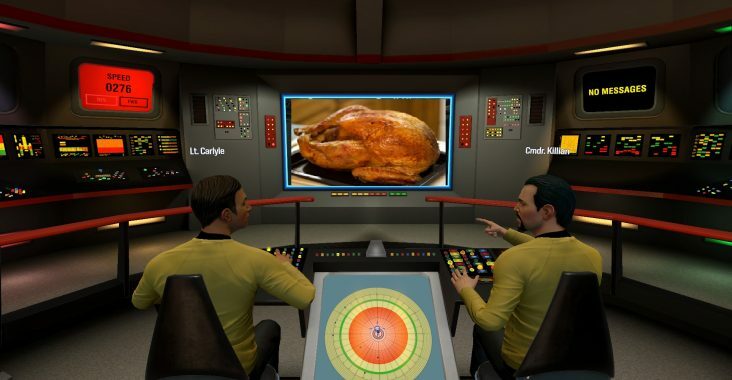 They also have a Star Trek VR experience as shown in the feature image. It looks pretty great to me! The Toronto experience sounds as positive as mine was PAX West this year. This might be the time that virtual and augmented reality really stick. That’s it for now – have a great Thanksgiving!